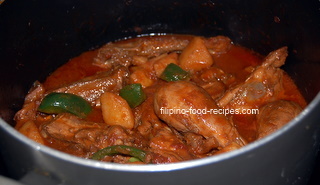 What's your favorite Filipino Afritada recipe? Is it made with chicken or pork? This Chicken Afritada is unmistakably a Filipino dish. It has a savory tomato base sauce and cooked with vegetables such as bell pepper, potatoes and green peas. Some old Philippine cookbooks call it Fritada - which is a Spanish dish, that literally means to fry up. Although the most popular meat to cook for Afritada(also Apritada) is chicken, pork can also be used. 2 Using the same pan, stir fry the garlic, and onions. Add back the chicken and stir in the tomato sauce and chicken broth. Bring to a boil. 3 Turn the heat down to simmer for 10 minutes. 4 Add the potatoes and bell peppers and simmer for another 15 minutes or until the potatoes are tender. 5 Add the green peas, then season with salt and pepper. Dredging the chicken in flour before pan-frying will thicken the sauce. However, you can omit the flour and use breadcrumbs instead, but should be added in the end. If you want to add chicken breast with the thighs and legs, remember that breasts cook faster that thighs and legs and can tend to be rubbery and bland when overcooked. So add it together with the potatoes on Step 4 for less cooking time. Frozen green peas are already cooked so just add them towards the end of cooking. I don't like to use canned green peas because they are quite pale in color and do not make the dish look appetizing.